We continue our series on how to expand your dairy business with an inside look at how new innovation in energy management is helping producers lower costs, save time, money and, of course, energy. Dairy farms are extremely energy-intensive operations. That means if you're thinking about how to expand your dairy business, investigating energy-efficient equipment can have a big impact on your bottom-line. Even just one or two upgrades can help reduce your dairy's energy consumption and, in turn, significantly lower your operating costs. We'll outline some of the key pieces of dairy equipment experiencing real energy innovation and why that matters to your dairy business. According to Efficiency Vermont: "Milk cooling accounts for 25% of a dairy farm's expenses". That's a significant portion of your business' overall operation costs. Fortunately, a cheap, easy way of significantly reducing those costs is by implementing a plate cooler in your milking system. The Innovation Center for U.S. Dairy Innovation Center for U.S. 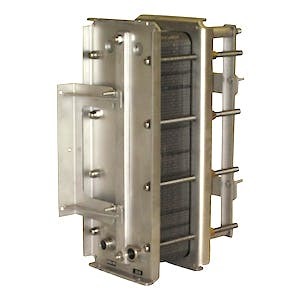 Dairy defines a plate cooler (also known as a plate heat exchanger) as "a set of stainless steel plates installed in the milk line before the bulk tank, using cold well-water to pre-cool milk, which increases milk quality by hindering bacteria growth, reducing cooling demand(s) on compressors, and saving electricity and energy costs for dairy farms". The Innovation Center also explains how this process works: "In dairy operations without milk pre-cooling, milk typically comes from the cow at about 98 °F, flows into a receiver, and is then pumped into the bulk tank. Compressors then cool the milk to a storage temperature of about 38 °F. Well-water passes through the plate cooler in one direction and absorbs heat from the warm milk pumped through the plate cooler in the opposite direction". In the case of a plate cooler, milk has already been pre-cooled so the storage tank’s compressors use less energy to chill the milk to the desired temperature. As a result, using a plate cooler can account for some of the greatest energy cost savings in any dairy operation, and is a particularly good investment for those in expansion mode. As the Minnesota Department of Commerce highlights, plate cooling is an area of production undergoing significant innovation from suppliers serving dairies keen to lower their energy costs. If you're looking to invest in this piece of equipment or think you may be better served by a newer innovation then it pays to research different alternatives best tailored to your dairy's needs. Finding a high-efficiency compressor can also play a major role in limiting your dairy's overall energy output. According to the Innovation Center for U.S. Dairy: "As compressors age, they naturally lose efficiency." Investing in innovation can play a role in maintaining or even boosting that efficiency. For example did you know that a scroll compressor uses up to 20% less energy than a traditional compressor? As the Iowa Energy Center explains: “A scroll compressor's design provides continuous compression without using mechanical valves, which is similar to rolling up a tube of toothpaste”. 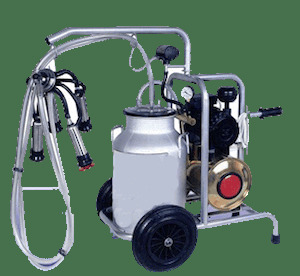 These types of compressors are ideal for dairy farms of any size. If you're thinking about how to expand your dairy business, researching equipment like scroll compressors can really lead to cost savings through reduced energy consumption. Variable speed drives (VSDs) and variable frequency drives (VFDs) are both vacuum pump controllers that can lower the costs of operating your dairy pump by almost 66%. Both of these devices do so by regulating the milking vacuum pump motor as well as maintaining a constant speed in the pump itself. According to EnSave, the chief energy consultant to the Innovation Center for U.S. Dairy, "Before variable speed technology was used for vacuum pumps, dairy operators had to run their pumps at a constant high speed to perform adequately during the occasional short intervals of high vacuum need". Now, dairy businesses are able to use VFDs and VSDs to determine exactly what vacuum-pump speed their system requires. As a result, the pump operates at a much lower speed and requires substantially less electricity (energy) to do so. We hope these three pieces of equipment have given you food for thought. By upgrading to newer, more innovative pieces of dairy equipment, you'll be reducing your business's operating and energy costs significantly. So much so, in fact, that these upgrades will actually end up paying for themselves in the long-run. Talk about a great financial mooove! In the next article in this series, we'll address the impact of mobile/information technologies on dairy farmers and their business operations.